Signs Banners Online make top quality lightweight screens for contractors to put on their fences and hoardings. 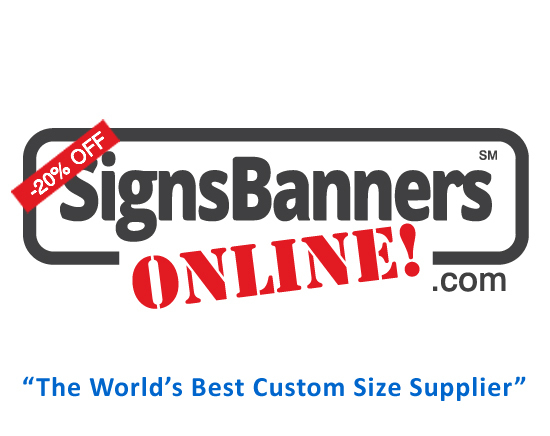 For the banner, sign or fence banners buyer they can now live chat to arrange the best size, price and art options with them. As a contractor, building, fence, hoarding, scaffold company in your area you can also send the size specifications to your graphic designer or freelancer and they can set your files suitable for grand format mesh printing onto the fence banner materials. The banner or site screen mesh (printed) is tested on the fence ready to send to the temporary fence hire company. Custom sizes... you do not need a minimum roll or height... Printed Fence Screen is an inexpensive solution offering full color design, personality, privacy and the ability to change the look of any fence cost effective logo application when multiple repeat logos are needed. New digitally printed fence screens offer the opportunity to beautify the construction site and benefit of promoting the store brands added to the project. Also add on safety messages and safe work logos. It's excellent that companies are able to surround the building site perimeter with company logo so effectively like this. We also learnt that many civil authorities now have set rules for dust reduction control, construction noise and pollutants for this so you can now get the high quality print customized construction mesh for those controls. Looking at the banner it is tested on the fence ready to send to the temporary fence hire company great for construction sites, renovations, & events! TIP: When you are arranging your screens, make the height from the tubing to the tubing 'underside' ONE INCH smaller so that you can tie off better. Use zip or plastic cuffs but dont over stretch the tension. A sign banner on a wire fence should not be pulled. When I want total NO SEE (block-out) blocking I use cheap bender board (builders board) or black plastic then cover with these banners. Thats the best. Make any custom size and add the graphics, upload to their printing factory to start. That material is 180d Polyester. Top grade. It's good. The Number 1 thing people need to get right. Fence Wrap - both sides. A scope of the work created in two weeks from the..